Earth Day is celebrated everywhere, but in light of San Francisco being named America’s Least Wasteful City, Ekua Impraim introduces us to five organizations in her city that are focused on addressing environmental problems creatively. 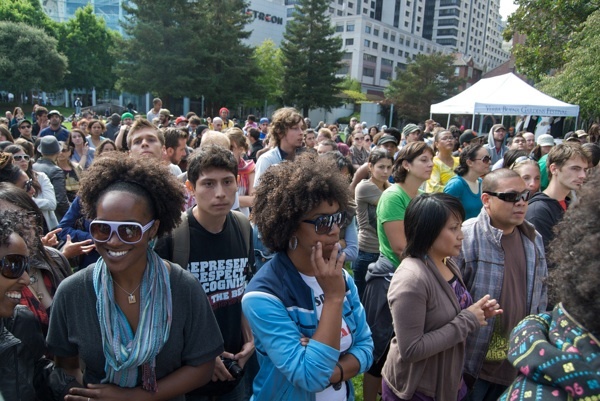 These organizations are based in San Francisco, but why not see if something similar exists in your community? And if not… take the initiative by taking these ideas and applying them where you live. Building Resources accepts donations of reusable items, typically sturdy home items that people have gotten rid of during remodels, and sells them to people who want to reuse them. By doing this, Building Resources diverts about 1,000 tons of materials from landfills each year. One of the coolest offerings is tumbled glass. Old broken windows, mirrors, vases, dishes, and pots are tumbled in cement mixers and become smooth and pretty little pieces that can be used for landscaping, flower arrangements, and art projects. Grind for the Green (G4G) aims to involve youth of color in the environmental movement through hip hop music and culture. It’s more than political lyrics à la Dead Prez; environmental responsibility is also promoted in the way their events, like green concerts, are run. A big part of what this organization strives to do is to provide real world applications for environmental involvement. It does so through offering paid internships and educating youth on green jobs, including hosting a Green Career Fair. I highlighted this organization in my Urban Volunteering: San Francisco. Literacy for Environmental Justice has been around since 1998 and has been combating environmental injustice ever since. It’s fought power plants, restored wetlands, and created a community garden. Most recently, LEJ opened the EcoCenter, an environmental education center that is completely off the grid. It’s wind and solar powered, has a living roof to regulate the temperature and catch rainwater, and on site waste water treatment. It seems like their quest has come full circle– they blocked the power plan;, now they are demonstrating a better way of doing things. Earth Island Institute was founded by David Brower, the first executive director of the Sierra Club. I first learned about the Earth Island Institute by volunteering at their annual Brower Youth Awards, which are given to six young people for their environmental work. Listening to them, I always feel and hope that I am watching the people who will eventually be the leaders of this country. Aside from putting on that event, the Earth Island Institute helps with wetland restoration, provides monetary and other types of support to a variety of environmental organizations, and publishes a quarterly journal. Garden for the Environment was created 20 years ago on what used to be a vacant lot. Now, it’s an acre of urban garden used as a model for urban farming. Garden for the Environment also provides educational opportunities for youth and low cost weekend classes in urban farming, including creating your own compost, raising chickens in the city, controlling pests in an environmentally friendly way, and creating your own community garden. What organizations are fighting for the environment in your community? Leave the name and URL in the comments below.